Holidays are just around the corner and with it another celebrations as Thanksgiving Day, Hanukkah, and other end-of-the-year celebrations, as an affiliate marketer your website needs to be ready to welcome your audience to read your product reviews and articles. You might have a niche that does well during this time of the year and you can include marketing campaigns in time for the Holidays. Your followers already know your site and they might be expecting to know about your recommendations to buy what’s on their shopping list. It’s well-known by many marketers November and December drive 30% more e-commerce revenue than the rest of the year. Experts know over 92% of the holidays shoppers will be surfing on the internet to read product reviews and find the best deal to get their Holidays gifts. The BEST shopping season is from Black Friday until Christmas. Amazon is top-of-mind; according to SIGNAL over 42% of the Holidays shoppers will be browsing Amazon and ordering their gifts from it. The Holidays are a good season to be an Amazon associate. If you haven’t thought about getting ready your site for the Holidays, you might want to think about it as it could be the best time of the year to make sales as an Amazon associate. 5 Good ideas to get ready your site for the Holidays. If your niche has no product for the seasons, you should not get discouraged by it, many shoppers like to get a product to give it as a Holiday gift for the recipient can use it through the year. There might be many products on your niche that you might have not thought about it as a Holiday gift, but their might be someone who is writing it down on their wish list for the Holidays. It’s the biggest shopping day for the Holidays. Many of your followers will be waiting for this day to go online and shop for their gifts to give during the Holidays, you need to think about the products you talk about on your site and check on the Amazon sellers if they will host a deal for that day, so you can write a post on time to share it with your audience. You always can update the content you already have in your site to let your audience know about it in time. Amazon always have ready banners for Black Friday and Ciber Monday so you can share them on your site. If you’re an Amazon newbie and you want to learn how to add an Amazon banner to your website, you can read this article, it’s for Father’s day banner, but you can follow the same steps and look for the Holiday’s banners. Amazon and many sellers will host a countdown offers, you can write a post to share it with your audience and share the best deals they can find on your niche with the best prices. You also can create content on your site to lead your followers on the countdown and find the best deals on your niche. Amazon like to share the 12 days of Christmas before it, your followers will love to find the best deals on your niche on time. 3. Include the best deals and offers on your content as lists. List always work good to rank your content better, and people love to read about the best deals they can find on your niche. Reading content that helps readers to find the best deal on any niche are a way that will help you to get loyal readers for your site, let’s think your site is about educative toys for young children. Top 5 toys for young children handcrafted. Best 10 toys to spoil your young children under 25 dollars. You can write a few blog post on your own niche to share with your audience in time for the Holidays, the secret to success and have more sales is to start today!! Hosting a Holiday Giveaway are a good way to promote your site and your niche, many people will be shopping on the internet looking to find the best find and deal, who doesn’t love to get something for free. It will depend on your niche to create the best giveaway before the Holidays to help you to grow your audience and traffic to your site. You don’t need to giveaway something big and costly, think on something you can afford and your audience will love to get it, this way you can get a lot of exposure, grow your list and more sales. 5. Holidays are beautiful and visual. Make it pretty, yes I’m talking about your content for this time of the year, don’t be shy, the Holidays are very visual! Create the beautiful banners to share them on your site, get creative and create the image for your content everyone will be sharing on Social Media, help your site to grow! Make the connection to your reader with your content, don’t be shy to be emotional, they will love it. It’s time to get to work, visit Instagram and Pinterest and get inspired, don’t be shy to visit your competitors and see what they did last time to promote their site for the Holidays! Get inspired and use Canva.com to great banners to share them in your site, create the most beautiful Pins so your followers will love to share them on their Social Media. Connect with your followers, talk to them and make of this season the best time of the year for them, for you and for your site! Bonus Tip – Everyone loves Free shipping. Find the products on your niche that will have free shipping during the Holidays, your followers will love to find the best deals for the season in time to order them. I don’t know about you, but I don’t like to pay any extra money when I do my shopping, and your followers might be the same as me, this is the reason why a free shipping will lead to more sales! Now you know, it’s the time as affiliate marketer to start to work to create content to get your site for the Holidays! You might know already, content needs time to rank well, the sooner you start to write a new article, the sooner you’ll publish it and don’t wait to share it on Social Media, go for it! I’m sure your site will be doing good during the Holidays this year! You have your own niche site but you want to learn how to make the best of it and work from anywhere? You might want to read How To Make Money Online Guide here! 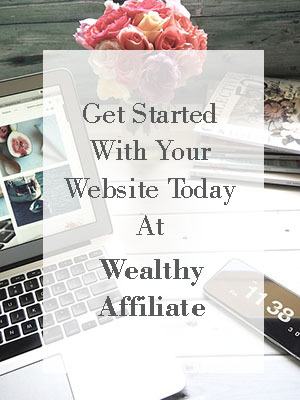 and don’t miss Black Friday Sale at Wealthy Affiliate! 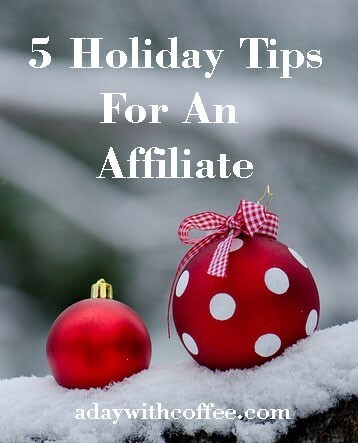 Great information in regards to the holidays and how they can be more lucrative for an affiliate marketer. Thats something i had never even thought about for whatever reason and its common sense. After reading your post im definitely going to try and double the amount of content i produce before the holidays come now that i realize online sales go up as well as sales in the retail stores. 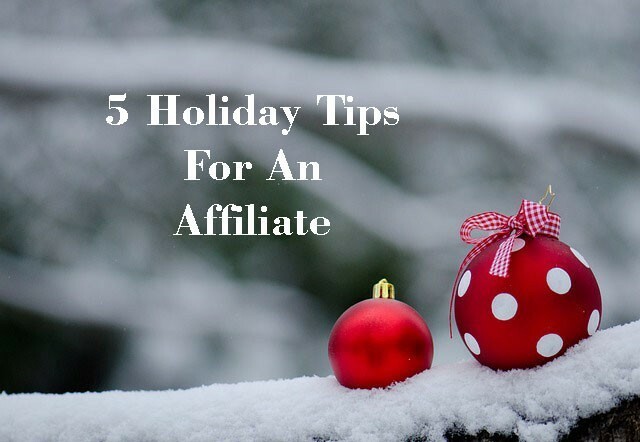 I’m glad you find this article helpful and you got some ideas to work on, as I said there’re a few things we all can do to help our affiliate marketing business to do better, Holidays season is the time of the year to do better, so we all need to work to have our websites ready for this time of the year. This is something I did not even consider. My niche is perfect around any holiday season. Giveaways also sound like a great idea to bring traffic to my site. I’m very glad I came across your article, now I have to switch gears and think about what to do for the upcoming holidays. I guess in the end it’s all trial and error. I’m glad you found my article useful and it gives you a few ideas to work on, it’s good to know you can work on these ideas for your website niche, keep working on it and hope you get lots of sales on this Holidays season! !